Kurdish-led forces on Friday declared victory over the Islamic State group in Raqqa, the former "capital" of its self-proclaimed caliphate where militants had terrorized the population for four years — setting up a climactic last stand for the extremists in the last vestiges of territory they control. But the spectacular devastation of the depopulated city raised questions about the cost of victory against a fanatical opponent and laid bare the difficulties of rebuilding areas where the jihadis put up a ferocious defense, leaving scorched earth and traumatized societies in their wake. From Fallujah, Ramadi and Mosul in Iraq to Kobani, Manbij and Raqqa in Syria, protracted military campaigns that eventually succeeded in flushing out the militants have left behind a trail of destruction so vast that they appeared to have been undertaken with little regard for the day after. 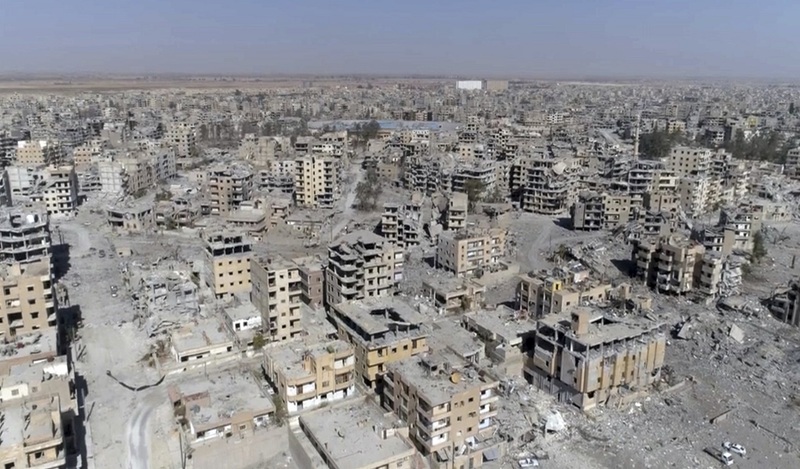 The United Nations estimated in September that 80 percent of Raqqa, a once-vibrant metropolis on the Euphrates River, was uninhabitable as a result of the years of fighting and airstrikes. Associated Press drone footage taken Thursday showed bombed-out shells of buildings and heaps of concrete slabs piled on streets littered with destroyed cars. 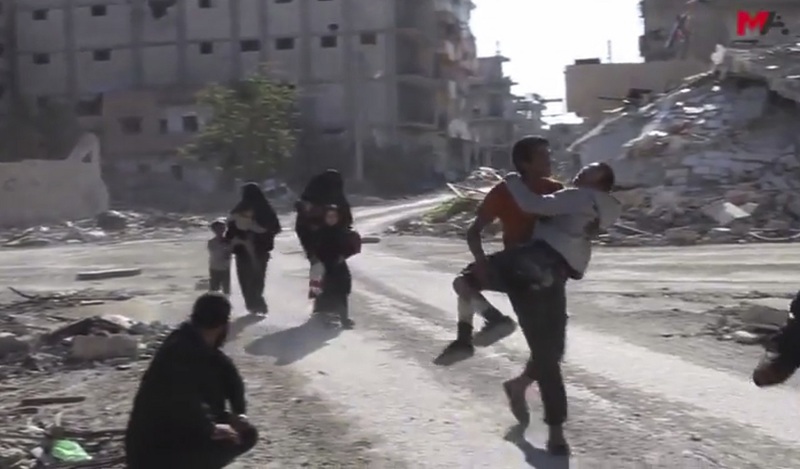 Entire neighborhoods were turned to rubble, with no sign of civilian life — testimony to the thousands of bombs dropped on the city mainly by U.S. warplanes. The months of clashes and artillery shelling did not spare any building, and what little of the city that remained was littered with land mines and booby traps. There was no water, electricity or health care service. Still, whether there was another way to wrest control of the city from the extremists is debatable. In a symbolic move on Friday, the Kurdish-led militia known as the Syrian Democratic Forces — America's main partner in liberating the city — made its formal declaration of victory from inside the city's stadium, which had been used as a huge prison and an arms depot by the extremists. An SDF commander also handed over administration of the city to a council of local officials and tribal leaders and a 3,000-strong U.S.-trained police force tasked with governance and security. "We call upon all countries and peace-loving forces and all humanitarian organizations to participate in rebuilding the city and villages around it and help in removing the scars of war that were inflicted by the (IS) group," said Talal Sillo, a senior SDF commander. But nobody is expecting aid to come rushing in. If previous cities recaptured from IS are any example, only a few people have trickled back and the only reconstruction that has happened was undertaken by private initiative. Much of what happens next in Raqqa depends on questions with no clear answers, including how Turkey responds, and whether the U.S. stays long enough to stabilize the city and protect gains made by its Kurdish partners. So far, the U.S. has shown little appetite for longer-term engagement or involvement in nation-building in Iraq and Syria. At a briefing in August, Brett McGurk, the top U.S. envoy to the coalition battling the IS group, said no one should look to the United States to foot the bill for long-term reconstruction. "This is an international problem," he said. On Friday, the U.S.- led anti-IS coalition said in a statement that Raqqa will return to local governance and leadership and that the city's residents now have a chance to control their own future. But most Raqqa residents have long fled, with tens of thousands of the city's former inhabitants scattered across refugee camps or abroad. 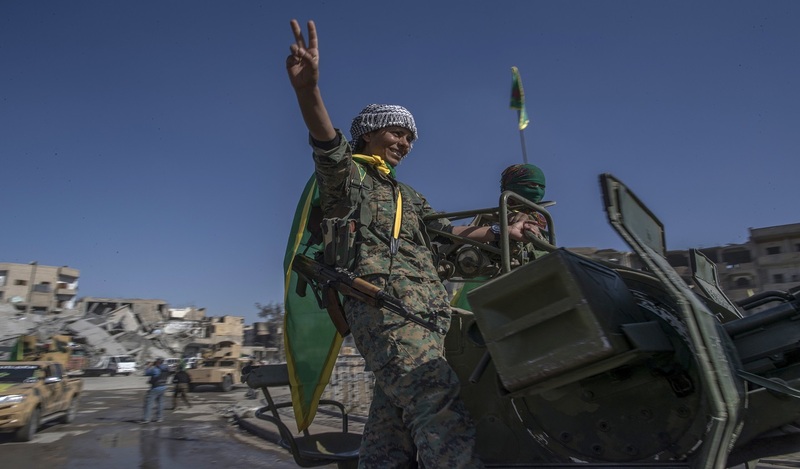 There is nothing for them to return to, and many of the predominantly Sunni Arab population distrust their liberators and the Raqqa Civil Council, which they see as a cover for the Kurdish-led SDF. "We are calling upon the international community to help in rebuilding Raqqa, a city that has been destroyed while defending the whole world," Omar Alloush, a member of the civil council told the AP. He acknowledged, however, that politics would likely get in the way, noting for instance that all borders between the SDF-controlled areas and Turkey, the closest neighbor but a sworn enemy of the Kurds, are closed, and that material needed for reconstruction would have to come either from Iraq or from areas controlled by the Syrian government, which has vowed to eventually retake control of Raqqa. In a sign of the complications to come, Turkish President Recep Tayyip Erdogan on Friday slammed the United States for backing the SDF and demanded an explanation for posters hung in Raqqa of Abdullah Ocalan, the imprisoned leader of the outlawed Kurdistan Workers' Party, or PKK, which Turkey considers a terrorist organization. Syrian President Bashar Assad has vowed to recapture every inch of Syria, including Raqqa. His forces have neutralized the threat from Turkey and Saudi-backed rebels trying to topple him, and are currently focused on fighting IS in its last remaining stronghold in Syria in the eastern province of Deir el-Zour. Backed by its Russian and Iranian allies, Syrian government forces have retaken 90 percent of Deir el-Zour city from IS in the past month and are making fast advances in IS-held areas of the province with the same name. The IS leadership is believed to be in hideouts in the province, but appears to be losing control. Following Deir el-Zour, the Syrian government may want to go after Raqqa, or negotiate a return of the city with the Kurds. Syrian state-owned media has not reported or commented on the SDF's capture of Raqqa this week. Rashad al-Kattan, a fellow at the Atlantic Council's Rafik Hariri Center warned in an analysis this week that the euphoria that followed the fall of Raqqa can quickly evaporate. "The challenges are immense for stabilization efforts there, especially after the very high cost the city and its residents had to pay in terms of destruction and displacement," he wrote.